Judyta Frodyma is a specialist in Romantic literature and early Canadian poetry. Prior to joining the faculty at King’s, she was a SSHRC Postdoctoral Fellow at the University of Northern British Columbia (2015-2017), and she completed her DPhil (2011-2014) also funded by SSHRC and MSt (2009-2010) at the University of Oxford and her BA (2006-2009) at the University of Toronto and the Sorbonne. 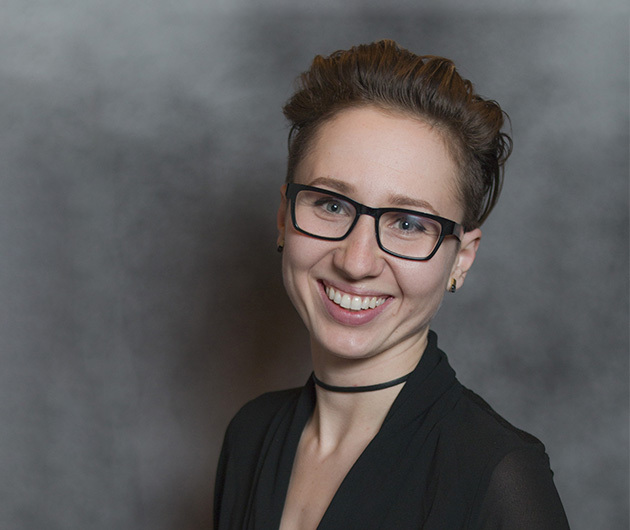 Her current research project explores the discrepancies between form and content in early Canadian poetry, particularly as demonstrated in the writings of the Confederation Poets (Roberts, Lampman, Carman and Campbell Scott), and their Romantic and Victorian borrowings. This discrepancy, she argues, is assuaged via the work of the hybrid poet-performer, E. Pauline Johnson (Takehionwake). Her previous book, Scriptural Topography in the Romantic Era: Wordsworth and the Old Testament, is a study of the Biblical language and imagery adopted in the nineteenth century by writers such as Wordsworth to beget a sense of community, human and non-human, in their current environment. Her research interests include critical theory, American poetry, humanistic geography and non-linearity. She has taught courses on Wordsworth, Drugs in the Nineteenth Century, Romanticism, Milton, American Transcendentalism, Henry David Thoreau, Shakespeare, Modernism, and the 20th Century American Novel, amongst others. She has published on Robert Lowth and biblical parallelism, on ‘wilderness’ in Wordsworth and Thoreau, on narrative time in Wordsworth, and is currently writing an article on Charles G.D. Roberts and the Shelley Centenary. In her spare time, she is a triathlete, climber and long distance runner. British Romanticism, Critical Theory, Transatlanticism, Early Canadian Poetry, Nineteenth-Century Poetry, Ecocriticism, American Transcendentalism, Phenomenology, Lyric Theory, New Materialism, Form, Landscape Studies, Humanistic Geography, Non-Linearity, Dwelling, Old Testament, Biblical Hebrew.